Marsa Matruh lies on a bay on the Mediterranean, about 290 km west of Alexandria and 222 km east from Sallum, on the main highway from the Nile delta to the Libyan border. The distance from Cairo to Marsa Matruh is about 524 km. Another highway leads south from Marsa Matruh to the Western Desert and the Siwa Oasis. In Pharaonic times, Marsa Matruh was known as the Store of Beans, because it was crowded with people and activities. This makes this area an archaeological excavation site. During the reign of Alexander the Great the fishing town of Marsa Matruh was known as Amunia. From here Alexander the Great set out on his historic journey to the Siwa Oasis. Then, during the Ptolemaic Period, the city was called Paraitonion. The harbour provided a base for Cleopatra’s fleet during the conflict with Augustus. During the Roman Period the town became an important harbour for trade and sending goods and crops to Rome. Marsa Matruh was named Paraetonium at that time. During the Byzantine era Marsa Matruh was again known as Paraitonion. Nowadays, Marsa Matruh is the base of the Egyptian sponge fishing fleet. It is also a busy trading centre for the Bedouin of the Western Desert, who bring to market their sheep, wool and agriculture products (barley, dates, olives and melons). 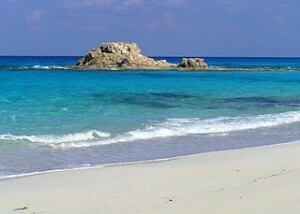 Marsa Matruh is also known for its numerous breathtaking beaches with white soft sands and calm, crystal clear waters. The large bay is protected from the high seas by a series of rocks forming a natural breakwater. The water’s colour ranges from blue to green, due to the depths of the bay. The irregular sea ground forms an amazing underwater world of mountains, valleys and colourful fish species. The shoreline contains many lovely beaches with pristine, turquoise blue waters. Enjoy walking along these beautiful sandy beached barefoot. The largest beach for a good swim is Gharam Beach, the Shore of Love, about 17 km out of town. It is actually facing the town, occupying the last stretch of land around the bay before it opens up to the Mediterranean Sea. This paradisiacal location is a perfect romantic beach getaway. Feel the calm waves here, caressing the fine and soft sand. Do not fight the temptation of sinking your toes into it and diving into the infinite turquoise blue. Another pride of Marsa Matruh is Agiba Beach, about 28 km downtown. Agiba means ‘miracle’ and Agiba Beach is just that, a natural wonder. This beach lays in a semi-circle at the bottom of and in between protecting limestone cliffs with numerous caves and is no more than 40 metres long. It is only accessible via a path leading down from a high and huge cliff. The sand is cleaner here and the temperature cooler but the day is quit short at Agiba Beach, as the cliffs on both sides take away the sunset hours. So, when the sun rays start to hide its time to climb up the cliffs, because the view from the top is really glorious. The most famous beach is probably Cleopatra’s Beach, where according to the legend Cleopatra came to bathe with her lover Mark Anthony. It is a wonderful bay with clear waters, surrounded by rocks, who give it the impression of a vast, square pool. It is somewhat challenging however to swim between the rocks, with strong currents and waves swirling you around. But it is a fine place to relax. Another famous beach is Rommel’s Beach. The story goes, that this is the beach where the German Field Marshal Erwin Rommel, also known as ‘the desert fox’, went to take some time off and used to go for his daily swim during World War 2. The public beach is beautiful and offers amazing views of the natural lagoons of Marsa Matruh. On Rommel’s Beach you’ll find the cave where the German Field Marshall of the African Corps had his headquarters during part of the El Alamein Campaign, during World War 2. The cave has been transformed into a small museum honouring Rommel: the Rommel’s Museum. His personal effects, donated by his son Manfred, make this place worth a visit: the general’s full length leather coat, his compass and his marked up maps are all on display. At Umm el Rakham, about 24 km west of Marsa Matruh and south of Agiba Hill, you can explore the ruins of the Temple of Ramses 2. It dates back to the 19th dynasty (about 1200 BC). It was discovered by the Egyptian archaeologist Labib Habash back in 1942, and houses some admirable hieroglyphic inscriptions referring to the Ancient Egyptian pharaoh. Near the temple lies the Ramses 2 Fortress, surrounded by a brick wall, which was erected to protect Egypt from the attacks of Libyan tribes. At the Egyptian Fleet Anchorage, west of the port of Marsa Matruh, you’ll find the remains of Ptolemy’s naval installations. The Coptic Chapel was built in the early Coptic age. It contains several caves bearing inscriptions. You can experience the authentic Egyptian atmosphere by visiting the vibrant Libyan Souk and taking in the sounds and smells. Locals barter for everything from wool, olives and sheep to dates and watermelons. You’ll find here local products but also goods from other countries northern African countries.